Photosounder is the first audio editor/synthesizer to have an entirely image-based approach to sound creation and editing. Thanks to its powerful and omnipotent synthesis algorithms, it is capable of creating any sound possible. Powerful built-in image editing tools, some yet unknown to general image editing programs, are specifically tailored to enable you to create and edit sounds with ease in ways and with results simply impossible with other programs. The immense possibilities offered by Photosounder are only starting to be discovered. Every day spent using Photosounder brings new discoveries, new kinds of sounds never heard before, new effects never approximated, new takes on classical effects or methods, all merely by combining the power of the simple set of tools built in the program. Photosounder is available for Windows (64-bit, Windows XP and above), macOS (64-bit, 10.6 and above). It can also run on Linux using Wine. A demo version is available, with the ability to save the resulting sound to file disabled, and a short silence inserted every 12 seconds. The full version is available for $79 (about €66, £56 depending on the exchange rates) for a full commercial license. More details on the Buy page. Lossless processing of sounds based on images, so that real sounds can be transformed by transforming their image. Noise-based synthesis for synthesising original sounds from nothing or resynthesising wildly transformed sounds in a way that results in a continuous and smooth spectrum. Pro-tip: Turn on the Live Synthesis in the Options menu for instantaneous results! Exclusive spectrogram analysis algorithm that natively operates on a logarithmic scale and can vary time/frequency resolution depending on frequency for a better clarity and a better resynthesis. Real-time live synthesis, allowing real-time time-stretching or to hear changes as they are made to the images. Dedicated graphical editing tools best suited for editing or creating sounds, such as various sprays to enhance, suppress, erase or create features, including a harmonics modifier to apply all modifications to a frequency and its harmonics at once. Layer system similar to Photoshop's, with layer groups and various layer blending modes, including exclusive layer convolution modes. 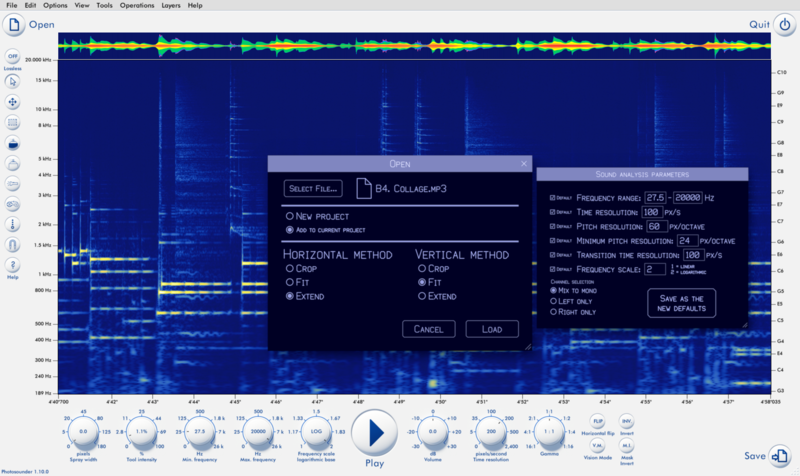 Extensive graphical/mathematical operations specially adapted to spectrogram editing which allow you to apply all kinds of effects, from the most common (such as EQ, compression, denoising...) to the weirdest (envelope reversion, spectral gating, pitch inversion, spectral quantization...). Processing in third-party image processing programs by exporting images to BMP files and importing of the externally modified images. Rhythm and note overlays to help with music composition. Ability to restore a session, even after a crash. All actions are instantly saved to a history file in a human-readable language so none of your work is ever lost. Also allows you to edit the history by hand or save a project and all its history. Easy scripting to automate actions. Images processed in 32-bit precision. Sounds processed and exported in 32-bit precision (with an option to export to 24-bit instead). Opens audio formats such as MP3, OGG, WAV, AIFF, FLAC and various others and allows to export to 24-bit or 32-bit WAV, AIFF and FLAC. Opens image formats such as JPEG, PNG, BMP, PSD, GIF and various others and allows to export to BMP images. Can natively process, playback and export everything in any sampling rate (up to 384 kHz) supported by your sound card. Multicore support for faster processing and a smoother experience. The following is a non-exhaustive list of what has been found that can be done using Photosounder.